It was Christmas, and Ralphie was the last of the horses that had a shot at salvation before the trailer departed for hell. Only 2.5 years old, he was scrawny and barely broke. He didn’t fit the ideal profile for people looking for a cheap horse: 8-year-old, dead-broke, babysitter gelding that saddles, rides, trains and grooms itself. We have religiously dressed Ralphie’s tail every day for the last 9 to 10 months, paying almost $3,000 for veterinary care and every treatment you can fathom. We’ve tried everything to make this sweet baby comfortable. Talk to us about "Adopt One, Get One for Half Adoption Fee" for Raven and Alfred! 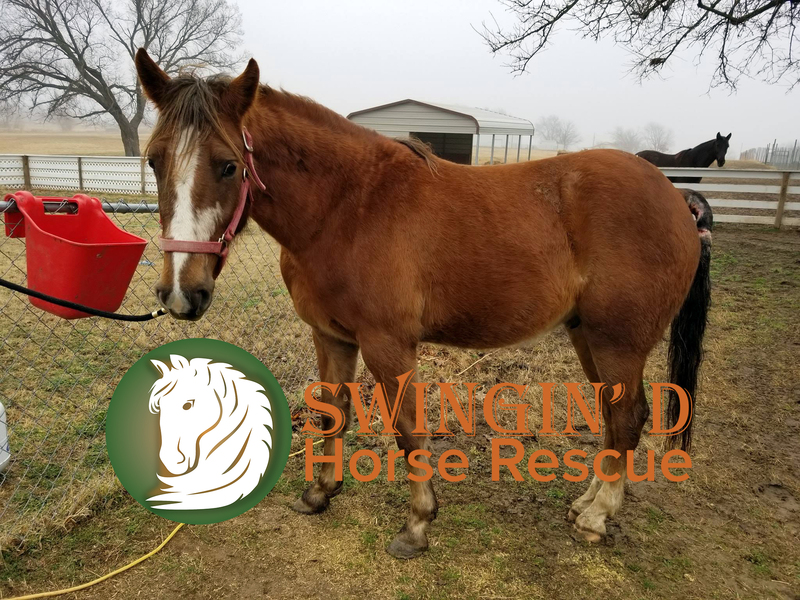 Raven almost didn’t make it to sanctuary at Swingin’ D. We were full to the brim and not in a position to bring in another horse – let alone a mare. Save Our Standardbreds from Slaughter (SOSS) was desperate to find shelter for several horses and asked if we could take one in addition to Alfred. Listed at the kill pen as Sam’s Token – a 17-year-old gelding – Raven was one of two standardbreds facing certain shipment to slaughter. Since we have a quarantine pen we can split into two paddocks, we went against our policies and agreed to bring in what we believed was another gelding. It was only when we picked up Sam’s Token at the lot that we learned she was a mare. By that time, we were committed, and the spark of true love was lit shortly after. From the moment Raven arrived at the ‘D, Alfred has been hopelessly devoted. They survived the same kill pen together, quarantined together, got their teeth floated and vaccines together, and live and sleep together. They’ve been through enough; so our preference is to keep them together. Anyone who can offer both a home can adopt the pair for less than $1,500. "Her ways are pleasant, and all her paths are peaceful."